Marie Curie would hate this book. 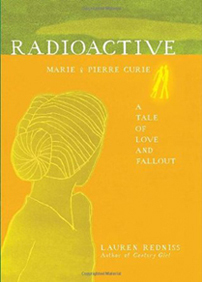 Lauren Redniss, author ofCentury Girl, concedes as much in her epigraph to Radioactive: “With apologies to Marie Curie, who said, ‘There is no connection between my scientific work and the facts of private life.’” Certainly Curie had a right to her privacy, but to keep a subject’s private life sealed off is too much to ask of any biographer. Is Radioactive a biography? Well, it does follow the major events in Marie Curie’s life (1859 – 1934)—her scientific breakthroughs, as well as her tumultuous love life, including a scandalous (at least in 1911) affair with a married man. The book also functions as a primer on the history of radioactivity, often leaping from the Curies to events such as the Soviet Union’s Chernobyl Nuclear Power Plant disaster. All this is told with the charm of a lushly and lavishly illustrated child’s book. While this book will leave you pondering “love and fallout,” it will also make you ask that confounding question: What exactly is a book? What better time to contemplate this issue than now, when the New York Times has begun to include e-books in its bestseller list and when Borders has declared bankruptcy, in part due to the changing format of books. Lauren Redniss clearly loves books, though to her it’s a protean form we have yet to nail down. Print, for example, isn’t a block of prose for Redniss. 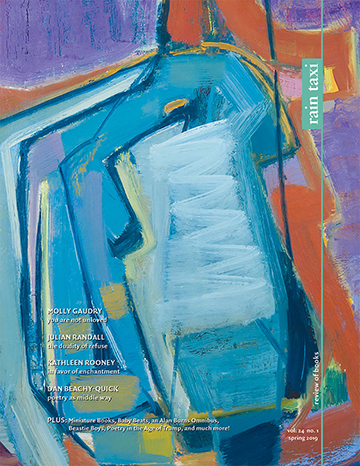 The print in Radioactive changes in size, depending on the quantity of text the author needs to fit on a particular page. At other times, the space between the lines varies. And at other times, the layout resembles rock and roll posters of the ’60s and ’70s. On one page, for example, we see a hand clutch a test tube with the text rising from it like a pyramid-shaped cloud. Part of the enjoyment of turning the pages of this book is that the reader never knows what to expect. 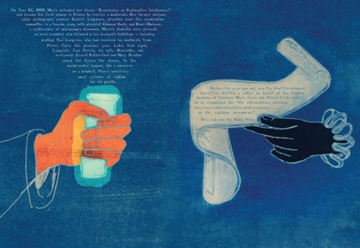 In addition to her breathtaking drawings, Redniss incorporates the first X-ray ever made (of Wilhem Rontgen’s wife’s hand), typed pages from an F.B.I. file, an “atomic bomb damage status” map of Hiroshima, a photograph of drill assemblies used for underground nuclear tests, and a blindingly bright double-page drawing of an “ALL-HEXAHEDRAL ELEMENT COMPUTATIONAL MESH OF A SIMPLIFIED MODEL OF THE ADVANCED TEST REACTOR AT IDAHO NATIONAL LABORATORY.” She associatively weaves these images and more into the story of the Curies. While Redniss clearly admires Marie Curie, the author doesn’t shy away from dealing with the consequences of the Curies’ discoveries. This 1903 quotation from Pierre Curie shows even he harbored fears about their work: “It could even be thought that radium could become very dangerous in criminal hands, and here the question can be raised whether mankind benefits from knowing the secrets of Nature, whether to profit from it or whether this knowledge will not be harmful for it.” Little did the Curies know that “non-criminal” use of radium would include the poisoning of watch dial painters, the bombing of Hiroshima and Nagasaki, and nuclear reactor accidents at Chernobyl and Three Mile Island. To her credit, Redniss makes all of this part of the Curie story. Given her balanced approach to the Curies and her skepticism of the miraculous claims made about the properties of radium, the book ends on a false note. We hear Steven Howe, a nuclear engineer, wax poetic about the use of nuclear technology that will allow us to have colonies on the moon with dwellings made of glass bricks. “The bricks [made of lunar dust] will stop the galactic cosmic radiation and let sunlight through. You’d have greenhouse capability. You could have glass cities and glass roads. A crystal city.” Given the seductive nature of power, especially nuclear power, what’s to stop someone stationed in this crystal city from deploying nuclear weaponry on an enemy satellite, or even on Earth? And what about the nuclear waste? Where and how will that be dealt with? Hasn’t Redniss showed us, over and over in these pages, the deadly results of radioactivity? Didn’t it even take the life of Marie Curie? Perhaps Redniss could not help but succumb to the eerie spell of radium. Marie Curie is said to have kept some radium in her desk drawer and stared at its glow in the dark. Though she didn’t know the deadly results of such a practice at the time, would she have been able to resist had she known? Shouldn’t we know better now, even as we still talk about building “safer” nuclear reactors, and “storing” nuclear waste underground for thousands of years—and, yes, building nuclear-powered moon colonies? Could the “love and fallout” of Redniss’s subtitle refer to our irrational love of the atom? Anyone interested in the Curies, the history of radium, and approaching science with a sense of wonder will treasure this mesmerizing book. Those who worry about the future of the book will be reassured byRadioactive—with its unique graphic approach and glow-in-the-dark cover, it seems a sure sign that the print and paper format will mutate, but endure.